Barnt Green Waters welcome you to the "Boathouse" venue, home of both our Sailing and Fishing Clubs. We extend our full range of in-house training facilities in an ideal environment to you, ensuring that you are equipped to deliver a successful day to your Clients and Colleagues, to the high standards we know are required. 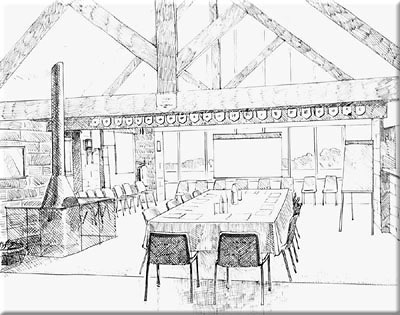 The sketch above by local artist Nick Day shows the venue laid out for a small seminar in "boardroom" with white board and projection screen. The log burning fire to the left behind a safety guard and through the large window at the far end of the room, a view across the 80 acre Upper Bittell reservoir. Click the image for a larger version which opens in a separate window, to be closed after viewing. (Please note : all images are copyright BGSC and the sketches are copyright Nick Day, artist, Alvechurch, Worcestershire. None are to be used without prior permission from BGSC). Our catering facilities can provide a choice of menus ranging from sandwich platters, hot and cold finger buffets to a full 2 / 3 course lunch menu to select from. Coffee and a variety of teas and soft drinks are always available. Our Coordinator is available to meet with you and discuss your specific requirements, to enable us to plan your event accordingly and carry out the advanced arrangements, thus ensuring you concentrate on your own preparations. Our Coordinator will also be available throughout the day of your event, to overcome any unexpected issues that may arise. Located within the elbow of the M5 / M42 motorways with nearby access from Jct 4 of the M5 and Jct 2 of the M42, the "Boathouse" venue is situated at the end of Cofton Church Lane, which is between the roundabout at Cofton Hackett and the village of Barnt Green.